Every successful business has a mission statement. A common understanding of where the company is going and how they will get there. A common vision. A constant reminder. A thread that weaves the organization together. So wouldn’t it make sense to apply that application to one’s personal track? A statement that defines one own’s existence. I know…pretty deep. Let’s face it, the world around us is changing and some argue not for the good. Dysfunction is becoming the norm. Things used to be simple. When I was young, we only had 5 TV stations, and only one of them was cool. And I’m only 35! Now my satellite has over 600 channels and I can’t find anything good on the TiVO. Oh, what a complicated life we have created for ourselves. If we are going to have a more productive, functional society we have to step up to the plate. We have to leave this world in better condition than we found it. Reverse the trend. Whether it is in your chapter, family, company or community we have to make a commitment to make a difference. As we do, we are leading by example. If this is done in an enthusiastic, appropriate manner you will find it to be contagious and others around you will become infected, and thus the cycle continues. Deltasig is a tool that can assist you in meeting these goals. It can be a deep meaningful experience, or a line on your resume. The option is yours. Some of the non-fraternal members in my life have questioned my involvement in what they deem to be a “collegiate organization.”It is hard to describe the leadership and time management skills I developed in college; interpersonal skills learned while on the Board; the ability to sell a worthy cause as a Trustee. These are all subjective skills that are hard to put a “price tag”on. However, there are other skills that can be valued. 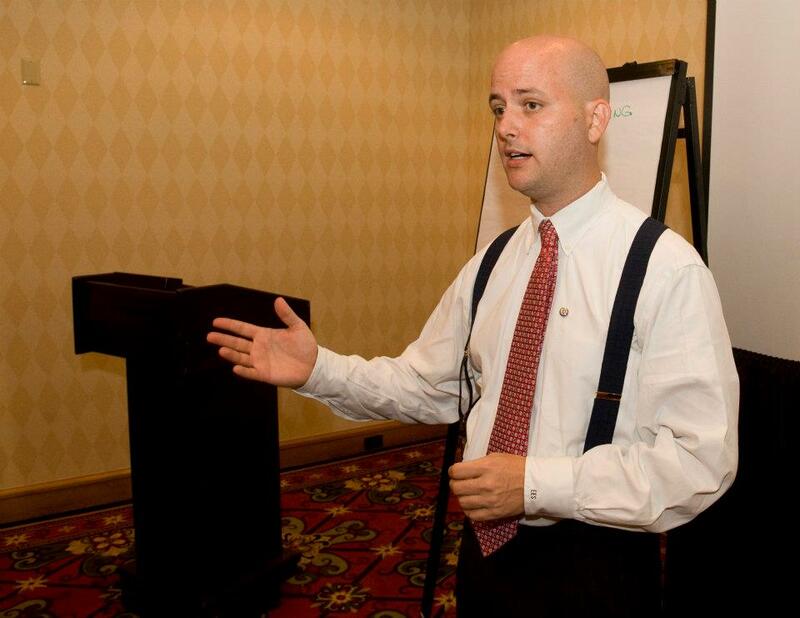 Since graduation, I have presented seminars at 7 congresses and dozens of LEADs. Now I am doing the same thing within my professional associations. My peers have not had the opportunity to gain the experience that I had the privilege to enjoy as a Deltasig. This has directly contributed to my professional success. I can put a value on it. I have also used Delta Sigma Pi as an opportunity to give back to the community. If everyone in the world put effort into a selfless act, well… this would certainly be a better place. It is unrealistic to think that everyone will take this extra step. However, if you did, that would be one person. If you do so enthusiastically, you might influence others to do the same. Whether it’s your participation in your chapter, your involvement of time in community events or financial support of charitable organizations, I respectfully suggest as a leader you should “lead by example”and do something that matters. As we celebrate 100 years of brotherhood, I must say, I’m proud to be a Deltasig! 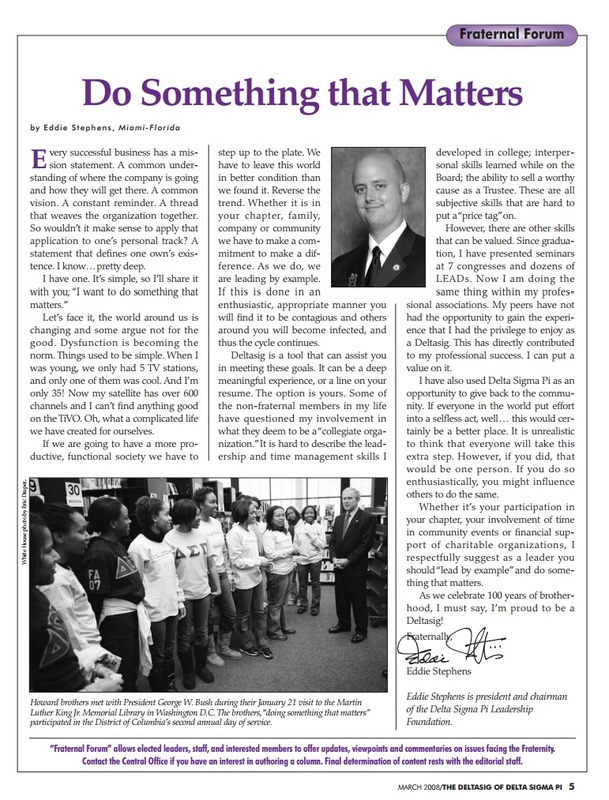 Originally published in The Deltasig, March, 2008.